Inspired Self Help Article On Understanding Yourself! Remember Who We Really Are! Through the stories, ideas and concepts contained within this inspired self help article, my desire is that you’ll start to see through the artificial veil of your physical mind. And in so doing, perhaps you'll begin to relax many of your outdated and outmoded pre-conceived ideas and prejudices’ concerning what life is. And thus you'll begin to redefine your ideas about the nature of existence and about who we really are. With this desire in mind, several different ideas about the nature of life are offered, together with ideas and understanding of what our mind really is and who we really are for you to consider. It’s understood that what's being said in this inspired self help article may not be complete or even 100% accurate, but from my currently limited perspective it's the way I now see it. If and when I receive more info I'll be sure to update this page. Ultimately my desire is that by simply reading the stories being told in this inspired self help article you might pick up on some of the spiritual and metaphysical concepts contained within them. And perhaps that will assist you to relax any insistence you might have of applying fixed and rigid labels to ideas and concepts which, after all, are abstract in nature. Once upon the no-time contained within the eternal moment of now, at some point, Spirit, being All That Is, all that ever was and all that ever will be desired to experience Itself directly. The all-knowing Spirit knew that as It is the Source of everything all at once, It could not experience Itself directly because there was no polarity or duality and thus no contrast in which experience of any kind could be played out. In the one eternal moment of Now, Spirit thought about separating Itself into infinite versions of Itself in order that It might know Itself directly through the experiences of all of the reflections of the myriad forms of Itself. And thus, the ideas of division, separation, polarity and duality were born. Meaning that, ultimately even before the "thought" of separation was thought, the separation of Spirit into myriad forms was complete. After the separation of Spirit (relatively speaking) there was Spirit and the Creator or the One Great Soul who knew that it was not really separate from Spirit or All That Is. With the division of Spirit into Spirit and Creator, polarity and duality were born. Thus, Spirit had caused separation within Itself by creating the One Great Soul in order that it might know Itself directly by the experiencing of Itself through the contrast of polarity and duality of the myriad forms of Itself. Of course, the idea of separation is just that, an idea. Spirit’s division of Itself is not empirical truth because One always remains One, there’s no real separation so Being always remains whole. Am I talking about spiritual life being eternal? I certainly am and this self help guru goes deeper into the idea of eternal life. Spirit is All That Is and is connected to and IS everything, so who we really are is Spirit. This inspired self help article image illustrates many ideas of who we really are. So the One Great Soul knowing that it is All That Is or Spirit, eternally seeks expansion into knowing more of Itself through the experiencing of more of Itself. Thus, the One Great Soul experiences more of Itself through the experiences of the infinite variety of individual souls which comprise the myriad forms of Itself. Humanity has an over-soul or a collective consciousness that’s connected to all individual human souls. In addition, Humanity's Over-Soul is connected to other over-souls as well as the One Great Soul (obviously). Humanity’s Over-Soul is often referred to as the Buddha Nature, the Christ Consciousness or the Krishna Spirit etcetera. Our individual soul is a collection of all of our individual experiences as spiritual beings from many lifetimes, past, present and future. All of these lifetimes and experiences are occurring multi-dimensionally and simultaneously. Thus, it might now be obvious to you that we can and do communicate with other versions of ourselves as well as receive guidance from the collective consciousness. Our soul is the heart of our being, so who we really are is our soul. Formerly we believed that there was an old man with a white beard who lived in the sky and who was our God, an idea which placed our power firmly outside of us. Thankfully we moved on from that idea and that's all well and good. However, we were then hoodwinked into believing the Newtonian mechanical view of the universe, the idea of a random yet dead world created by chance. This idea was also supported by people like Darwin, who due to his misunderstanding added false ideas concerning evolution. As long as we continue to believe in a world created by random chance we'll continue treating the earth as a resource instead of as a living being! Due to this current paradigm many people think (because of their conditioning) from a mindset that if something cannot be scientifically proven then it’s not true. I totally get that. Each of us has our own conditioning to see through and to move beyond. For this reason I’ve included a video which explains Oneness from a scientific perspective. Until you step out of your conditioning and start inquiring with discernment you will never know the truth of oneness! We Are All One. Physicist Explains Oneness from a Scientific Viewpoint. Your soul, for its own reasons desired to experience your current reality of contrasting polarity. A world of duality populated by beings who have contrasting ideas of light and dark, good and bad and right and wrong, a reality of light and of negative ego and judgment. In short a rabbit hole reality of self-imposed and self-limiting belief systems. Desiring to go down this rabbit hole your soul sent a piece of itself, you, in non-physical spirit form as an extension of itself. Because this reality is a game of self-imposed and self-limiting belief systems, prior to this incarnation you as a physical being were not informed of your true nature. You weren’t informed that you are, we all are, eternal beings of light and that each of us possesses all of the tools of creation. We’re here in this transformational age to move towards more clarity and more light concerning the nature of existence and the nature of who we really are. There is a veil that’s kept in place by the actions of the artificial personality construct of our mind, otherwise known as the ego-self. Once we begin to change our thoughts, our definitions and our beliefs concerning life, what’s real and what’s important, then the artificial veil that’s keeping us from knowing who we really are at our core begins to lift. And when it does we will remember that who we really are is eternal beings of light. Because our soul is us, our soul loves us unconditionally and absolutely - we can do no wrong in the eyes of our soul. The idea of any kind of judgment is merely an idea created by the negative ego personality construct. No matter who says otherwise, any form of judgment is not empirical truth! As a soul, prior to your birth, you must have agreed to be born into this rational reality of intellect, reason, logic, pain and suffering, a world of self-imposed and self-limiting belief systems. I want to remind you so that you know that your soul didn’t send you, a piece of itself, here unequipped and unsupported! When I say that you must have agreed to come to experience this reality, it’s because each being has free will to decide, to choose and to create an experience of any reality of their preference. The only limitations to this truth are each being’s self-chosen and self-imposed limitations. As physical manifestations and the embodiment of our soul in human form, we were given tools to assist us to achieve whatever it is that we came here to achieve. Our body is the vehicle we chose for this journey of our soul, while, based upon contrast, our higher mind conceives our experience and then our physical mind perceives our experience. So in a sense, who we really are is our body, mind and soul. Existence consists of energy vibrating at different frequencies providing the illusion of different realities. Thus, all that we see, hear, taste, smell and touch through our sensory organs is translated in vibrational form by our brain, the instrument of our mind. That is to say, the human brain is a receiver and translator of vibrational frequency. Once any vibration has been translated by our brain, we receive corresponding sensory feedback as an image, a sound, a smell etcetera. And then we say that’s real! However, what’s really real is only real based upon the vibrational translation and sensory feedback of our brain. In other words it's only real by our own estimation. Our physical mind consists of past memories and through these memories an artificial personality is constructed. Our physical mind is not our brain. Our brain is a tool that’s used by our physical mind to assist us to navigate through this particular reality game called "life on earth." Our physical mind is only designed to perceive, to know and to record how things have happened and how things are happening! Due to not being informed of the totality of our being and additionally because of our social conditioning, we tend to burden our physical mind with worry and doubt concerning our future. This is because, in general, we’re unaware of the existence of our higher mind. Without this forgotten knowledge a negatively focused ego-self is often born. This inspired self help article image illustrates how our physical mind communicates with our higher self. Our physical mind consists of two parts, the lower and higher minds. Even though our higher mind is non-physical, it's still a part of our soul’s current physical life experience on earth. Our higher mind holds the knowledge of all of the experiences that this particular expression of our soul has ever had (is having) and it can download that info to us to be used in this life experience. Because our higher mind exists at a vibrational frequency that’s higher than that of our physical mind it has a broader perspective and can see energy potentials not visible from the perspective of our physical mind, thus our higher mind is our ultimate guide for navigating through reality. Please note: Higher Mind, Higher Self and Inner Being are all labels for the same idea. But how does our higher mind conceive our desired future? 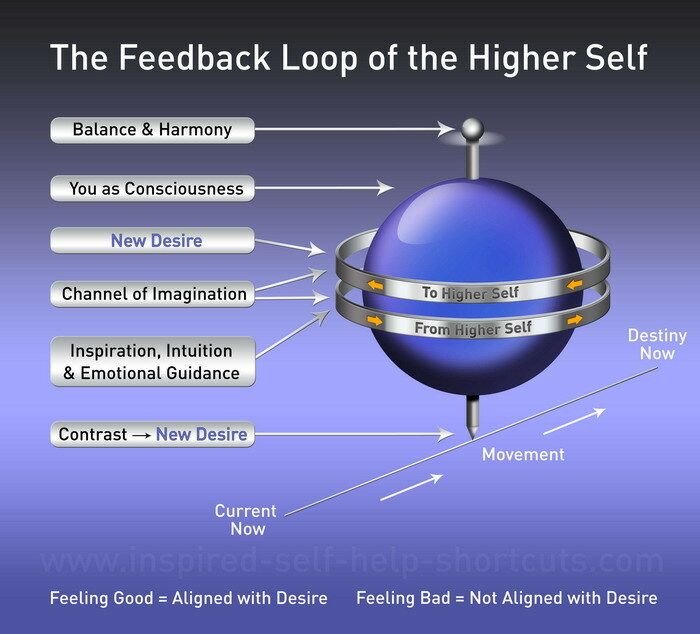 Based upon the feedback from our physical mind, our higher mind automatically and instantly goes forth, ahead of us as a physical being, and vibrationally creates our desired future in a kind of blueprint template reality. And then our higher mind calls our physical mind towards our already existing creation via inspirational, intuitional and emotional guidance, using the connection to the channel of imagination that’s been established by our brain. Remember, we can't fail to send vibrational feedback all of the time because we're emitting vibrational frequencies every Nano-second. Our own imagination is the conduit by which we communicate with our higher mind. We imagine what’s wanted and then our higher mind becomes that. So in a sense, who we really are is the imagination of our higher mind. So what is really real then? The One Great Creator of which we’re all a part is an eternal dreamer. The eternal dreamer, us, dreams eternally. We’ve always been dreaming and we always will be dreaming. In this particular experience whereby we know this, we have the option and the opportunity to wake up within this dream state that we call reality and realize that it is a dream. Birth and death are still part of the dream as discussed by these inspired self help authors. Creator exists now and so has always existed and always will, and you are Creator. While we play many parts in many dreams, ultimately, anything that exists, by its very nature, by definition, has always existed and so our life is eternal. Our life is and always has been exactly how we imagine it to be. Our human imagination or our dreaming is simultaneously the creator of our experience of reality, while at the same time it’s the reality itself. Or put another way, we’re both the artist creating the scene and we’re also the scene itself. Because our dreaming never had a beginning neither will it ever have an ending, that’s eternity. Ultimate reality can be seen as a dream in which who we really are is both the dreamer and the dream itself, forever and even forevermore. Another way of looking at what's being said is simply to say: we’re Consciousness being all that Consciousness can be, which is everything. 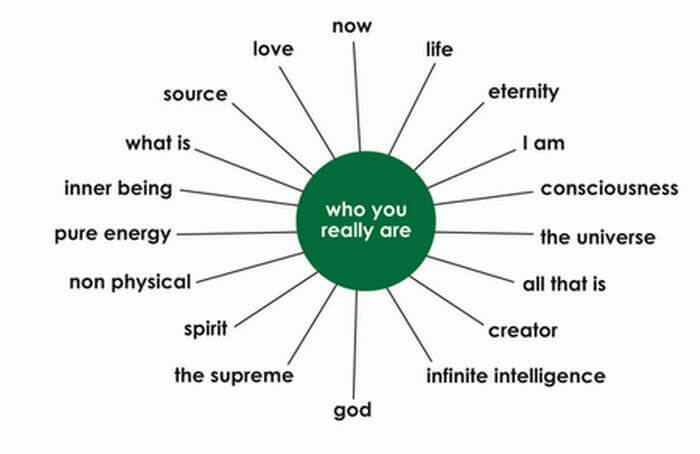 All of the concepts listed above are ideas and beliefs that we’ve imagined in order to help us to remember who we really are anyway. I elaborate on Consciousness on this personal self help page. From this reality or our current physical perspective, which again, is nothing more (or less) than our current definition of reality, we’re playing out the idea of forgetting who we really are. And that is still a part of all that Consciousness can be and obviously is. That’s why I like to view life on earth as a game of remembering. It’s not that Consciousness fills our reality and reflects Itself through our current perspectives, illusions or dreams, but rather that Consciousness IS all of those realities that we’ve defined as reality through our beliefs and definitions. So who we really are is Consciousness remembering who it really is. Click this image to get a FREE PDF containing an Inspired Self Help Article called "Dreams Within Consciousness." Once the new window has opened up you can read the document or save the file to your computer. Enjoy. Outside of the truth and the reality of the wholeness of being, which is the Oneness of Spirit, nothing is fixed. Life is and always has been an eternally unfolding story. Anything can happen in a story. What do you prefer to happen, what do you want to happen in the story of your life on earth? If you don’t like the current life story that you’ve created, know that you have all of the tools you need in order to change it into the story of your preference. What’s your preference? What's your passion? What feels good to you? What excites you? What sounds right to you? What’s important to you? Through this inspired self help article I suggest that you think on, clarify and decide upon these things. And then know beyond a shadow of a doubt that because you create your own experience of reality, you can and will create a life that fits your preference, 100% guaranteed. And how does knowing all of this help me in my day to day life? You might say, fine, lovely sounding philosophy or wow, somehow, that just feels right to me, but how does knowing about these things affect my everyday life experience? Read the best self help advice page on changing your reality, to find out! As you may have picked up from reading this inspired self help article that I prefer using the term who we really are to contain and mean all of the things discussed. That way, there’s no need to apply any one fixed label and risk becoming attached to it. Bearing in mind that any label we apply to something abstract is really just a place holder for our mind. This inspired self help article suggests that once we’ve examined, explored and got to the root of it all, labels are no longer needed for us to understand What Is and who we really are! 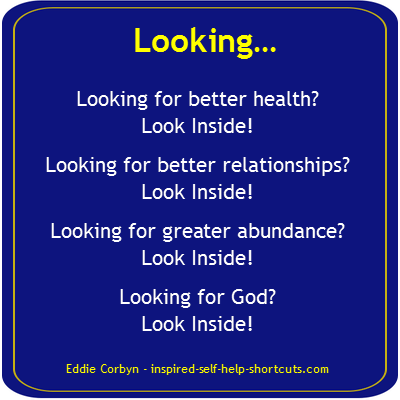 If you enjoyed reading this page please check out these short inspirational self help dialogues from the Divine!